The second book of a trilogy always faces challenges. It needs to be similar enough to the first book that fans can be reassured of more of the same thing they enjoyed. But it also needs to be different enough that it doesn’t simply retread the same ground. The same but different, familiar but new. 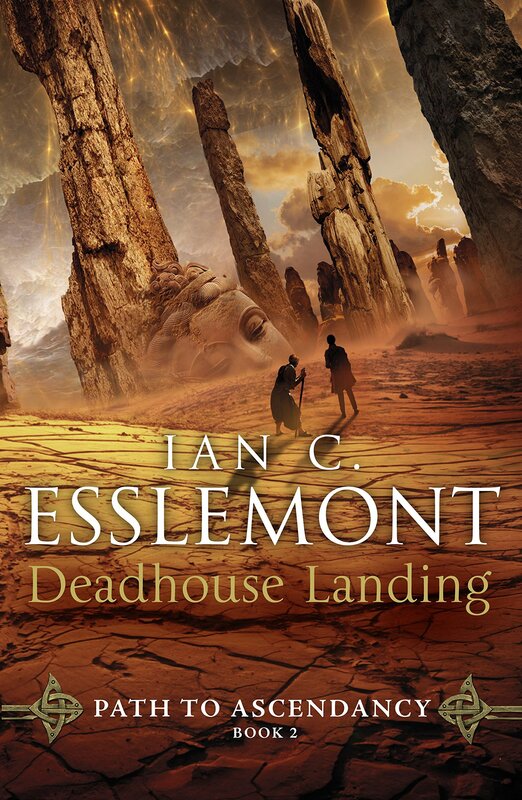 Deadhouse Landing and Esslemont find that happy medium of enough change to make the book feel new and fresh, but with enough structural and character similarities so that readers don’t feel lost at sea. The challenges and story beats explored here are not simply disguised portions of Lament served cold, but rather Esslemont has pushed the story, the setting, and the events in a new direction. As with Dancer’s Lament, the primary focus of this novel is the central story of Dancer and Kellanved and how they rose from low beginnings to godhood. Again, just like Lament this story gives us incremental progress to that long-anticipated moment, but keeps its focus on the events around them as they are happening, rather than looking off into the far future. Esslemont might have one eye on the long game, but the book is properly focused on the immediate goings on. But a significant change here is the acknowledgment that Dancer and Kellanved didn’t get to the finish line on their own, and this installment includes significant development of the legendary companions who coalesced around the pair. The result of this is that the central thread of Dancer’s point of view has slightly less prominence this time around. But this sacrifice is not in vain, nor is it that noticeable as there are some very interesting perspectives that take its place. As the blurb for the book alludes to, a significant focus of this novel involves Napans, a priest of D’rek, and the Mortal Sword of Hood. For Malazan fans, yes, I mean the Old Guard. Want to know how and why a group of Napans would join up with a mage and an assassin, read the book. Want to know how the Sword of Hood ends up throwing in with this crooked pair after the first encounters they had, read the book. Want to find out how a certain priest of D’rek ends up with these schemers, read the book. Their backstories might not be what you expect, but the events that throw these disparate characters together make narrative sense and should sate the appetite of even the most diehard fan. For fans of Lament, but who haven’t read either Esslemont or Erikson’s main series of Malazan books, there is nothing to fear in regard to these characters though. Although prior knowledge of the importance of these characters is a wonderful insight into who and what they are, this is a backstory that was not explored in the other series, and these are younger versions of the mythically distorted characters referred to in the annals of imperial history. So while a lot of the implied future of these characters will not be obvious to a new Malazan fan, none of their characterisation relies on that foreknowledge. Esslemont has been very careful to not rely on reader knowledge to carry the story or characterisation, and, as a result, the story works quite well without knowing the future history of those involved. Obviously there are some elements that simply work better if you understand the foreshadowing that is happening in front of you, but none of the major aspects of the novel rely solely on prior knowledge of the characters or story. The one downside is, new readers may wonder why they are following certain threads. One in particular in this novel does not have an obvious pay-off in terms of the volume itself, but seems mainly included as to build the foundation of the wider meta-narrative. A second also appears to have little relevance to the story of Kellanved and Dancer, but long-time fans will know why it is included. That said, both of these threads add colour, action, depth and interest to the story, so even if the immediate relevance is not outright stated, they are still interesting and still engaging. In Lament, the central point of view threads very clearly over-lapped and intertwined, and there was a strong element of necessity to who and what was shown. The sense in this novel is that some of the rigidity has been relaxed to allow for a more expansive and broader approach to the story. This widening of focus does make the book flow at a slightly slower pace than Lament, but the broader world and character view seems well worth that slight reduction in pace. It is still an engrossing read, it still holds your interest, and it still has moments of truly breakneck pacing. As is something of an established structure with Malazan novels, Esslemont once again employs multiple character points of view with a close third person focalisation, and utilises them to explore the various plot threads and sub-plots that weave together to form the story of the novel. As ever, this gives the world a wonderful sense of immediacy and intimacy, and allows Esselmont the ability to hide things from the reader because the character does not know or understand them. One of the most significant changes is that this time around the point of view cast has grown a little to accommodate the larger cast of important players. Admittedly, one of the things that I liked most about Lament was the very streamlined and story-centric narrative. Landing moves away from that slightly and more towards the larger canvas of the earlier series. In some respects this is fitting as Kellanved and Dancer move closer to their eventual fates and so style and structure mirror narrative progression, but I am glad that Esslemont reigned in the impulse to include each and every point of view he could have, and, as a result, the story still feels streamlined and focused. Given that this is a major feature of Lament, it is nice to see it retained. However there is a slight downside in the description of the setting of Malaz. It might be that the setting is so familiar to Esslemont that he doesn’t include quite so many of the wonderful little line drops that really bring the setting to life. With Li Heng there were small moments that were seamlessly integrated into Daner’s or Iko’s observations of the city that surrounded them that really brought the scenes to life. Li Heng lived and breathed as a city, and it felt all the more real because of it. The throw away descriptions gave a sense of individuality and uniqueness to the setting. There are far fewer this time around. One gets the sense that this setting is so vivid and engrained in Esslemont (and perhaps in the minds of many of his readers) that he didn’t add as many of those touches of colour that truly enliven the setting because they were already there in his head. For many this won’t be an issue, as the there are some other settings explored that feel new and tactile, but it is a minor gripe with an otherwise interesting locale. Another structural facet that seemingly works its way into all Malazan novels is the slow build up in the first parts of the book, to a massive convergence of character, plot, action, and power, in the latter stages. This is the dominant paradigm here as well. But, as with Lament, Esslemont ensures that the early sections have enough humour, action, and adventure, to keep the story moving forward, and the characters embroiled in intriguing events. Also, like Lament, the type of action and events that permeate the story are varied, and Esslemont has an impressive range of challenges for his characters that demonstrate a powerful versatility in his storytelling range. So while the central threads build and converge, the first parts of the novel do not feel slow, but rather feel like they are building to something. It is perhaps this sense of building that permeates the entire novel. Esslemont builds on Book 1 to broaden the world view, deepen the story, and drag the hidden secrets of the nefarious duo’s past before the reader’s eyes. He builds on past events to move the story forward to bring in new characters and new storylines. He builds on the mythos of the wider series of Malazan novels, both his and Steven Erikson’s. Yet in all of this, he never loses sight of the story he is telling in the moment. He never loses sight of the importance of the characters, their motivations, and their reasons for being there. He never loses sight of the need to entertain and engage his readers. One of the greatest strengths of any Malazan book is that you know, as a reader, as a fan, or even as an academic involved in fantasy analysis, that the authors, both Erikson and Esslemont, know their stuff. The world, its races, characters, histories, and mythologies, were gamed, discussed, developed, polished and played with by the two archaeologists. This gives a rare quality to their writing as every aspect of the world and story seems to appear truly authentic. Every Malazan novel has the feel of a history of a never-world. They are real stories of an unreal place. Sure there are wonderful and infuriating contradictions here and there, but given that each story is subjectively told, that characters make mistakes, and that histories have an inherent bias, bizarrely this makes the worlds and stories feel all the more real. Deadhouse Landing is a worthy successor to Dancer’s Lament. With sword fights and duels, pirates and politics, sea battles and mage storms, this has all the hallmarks of great epic fantasy, without the bloated page count and not a clichéd hero in sight. Esslemont seamlessly weaves great characters, action sequences, and genuine humour, into a fascinating narrative that details the history of two of the most enigmatic figures of Malazan history. This is an essential read for Malazan fans, new and old. This entry was posted in Article, Review, Uncategorized and tagged Book two, Dancer, Dancer's Lament, Deadhouse Landing, Epic, Esslemont, Fantasy, Ian C. Esslemont, Malazan, Novel, Path to Ascendancy, Review, Steven Erikson, Trilogy. Bookmark the permalink. I see this is your first post since June. Do you think you’ll be reviewing any more? Unfortunately, I don’t think I will be back doing this regularly in the near future. I have a few reviews I have to write up and post, but RL is not co-operating at present. So it may be a while before I start back up and resume a normal schedule of posts and reviews. I will be back though. It may just take some time. Nice review. After finding the Kharkanas books rather hard work, I raced through Dancer’s Lament and wondered what the reaction to the sequel was going to be. From what you say, I’m going have fun as soon as the post man turns up.